Caila Thompson-Hannant, of AK band Shapes & Sizes, has been playing up in Montreal as Mozart’s Sister and doing a darn good job of it. You can see Mozart’s Sister play live at the Pop Montreal festival on Friday the 23rd. 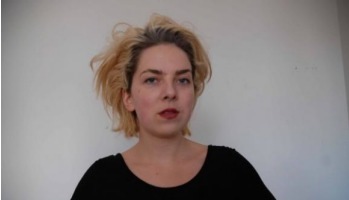 She’ll be playing at the Passovah Showcase with Montreal-based Miracle Fortress and rising Edmontonian stars Born Gold. Details here. You can stream and download three tracks from Mozart’s Sister below. The third release from Shapes and Sizes, Candle to Your Eyes, is ripe for release in just a couple of weeks. But until that time, Shapes and Sizes are touring as part of POP OFF III, a mobile offshoot of the increasingly popular Montrealcentric music festival POP Montreal. The tour will take them on a mini-tour of the western central part of the upper North American continent (sorry United States, this tour is Canada only) including Hamilton tonight, Toronto on Friday, and Guelph, Montreal, Quebec City, Fredericton, and Sackville to follow. Accompanying them are is BRAIDS. Complete details are here. It has been three years since Shapes and Sizes released their sophomore album Split Lips, Winning Hips, A Shiner, and in that time they have managed to squeeze in quite a bit of living and working. They have been getting married, opening record stores, starting and joining other bands (Elfin Saddle, Think About Life, Miracle Fortress), not to mention moving to Montreal and learning a new language. They toured with The National and Yeasayer, and opened for Sufjan Stevens and the Silver Jews. And alas, they managed to write and record their newest album A Candle To Your Eyes. The album is simultaneously more subdued and more dangerous than Split Lips. It is ambitious, confident and fiery and we think you will have a hard time resisting it. A Candle To Your Eyes will be released on August 3rd, but in the meantime you can listen to the lead off track below. Details here. Some albums are just so great they deserve more than one tour. We think so. Shapes and Sizes think so. You should think so too. Therefore, we are pleased to announce that the band will take Split Lips, Winning Hips, a Shiner back on the road for one last run before the they lock themselves up to write another album. So prepare yourself to become reacquainted with Calia’s stunning vibrato, Rory and Nathan’s fleeting and intense work on guitar and bass, and John’s ever-so-solid drumming. They will hypnotize you! They will mesmerize you! You will do cartwheels in the street in celebration! They’re kicking it off tonight in Brooklyn! Check out our tour page to see when they will be gracing a town near you, here. Though Montreal’s new record shop Phonopolis might appear to be just a hole in the wall, it is in fact a cleverly disguised quantum portal to the farthest reaches of sound and space. And who better to serve as your guide in these audio adventures than fearless captain and store owner Nathan Gage, who we know and love as one-fourth of Shapes and Sizes. In honor of Record Store Day (April 19th), we want to pay tribute to all the mom and pops out there and encourage our readers to continue your support of independent businesses, record stores or otherwise. We will save you the speech about the crucial nature of localized independent economies and cultures and the threat of the big box business mentalities. So for now, here is a shout-out to our favorite independent record shop. Phonopolis has been open for only five months and has already been nominated by CBC radio 3 as one of the best records stores in Canada. Nathan has stocked the store with a galaxy of indie rock, international music, classic jazz and blues, and experimental music of all genres and sub-genres. The store also hosts instore performances in the basement; so far Julie Doiron, Bryan and Steve from the Constantines, Elfin Saddle, Graham van Pelt from Miracle Fortress, Cryptacize and Shapes and Sizes have all played at the store. 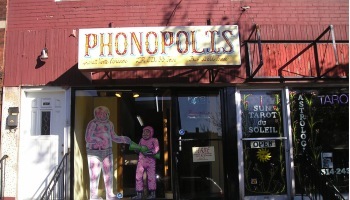 So if you ever find yourself in Montreal, be sure to stop in on Nathan and Phonopolis. And if you are there this Saturday you catch The Born Ruffians, The Luyas and Adam Waito & the Amethysts from 3 to 5:30pm. Music blog Stereogum have posted an outtake from Shapes and Sizes’ recent Split Lips, Winning Hips, a Shiner, and they’re "glad the lil’ life ‘n’ death-marching-hymn-that-could has finally surfaced." Go to Stereogum’s post here to march for yourself. We are too, because it’s a good tune, but it probably has something to do with Shapes and Sizes’ new tour with the Brooklyn pop-rock quarter Yeasayer (their MySpace page is here), recently signed to new Monitor Records’ spin-off WE*ARE*FREE group. The tour will start in Shapes’ homebase, Montreal, and end up in Hanover, New Hampshire, homebase to Jon Spencer. Click here for dates. What a way to end the Shapes and Sizes Half-Week: with a luv-luv-luvy sidebar from Rafter. Read it here, and thanks Rafter! Of course, Shapes and Sizes are also ending this Half-Week with a bang – a golden ticket bang that is! In the first printing of the Split Lips vinyl LPs, we’ve stashed 31 specially made golden tickets in 31 of the albums. But rest assured these aren’t just regular golden tickets. If you are lucky enough to receive one of these tickets, and then send it in the band, Shapes and Sizes will send back something "recorded, drawn, sewn, and/or constructed." Buy the vinyl here, and cross your fingers. Erik Osberg visualizes "Teller / Seller"
The visual end of Shapes and Sizes Half-Week finishes up with "Piggy," a video by Julia Feyrer. Caila of Shapes and Sizes wrote up a now-listening list, which we’ve posted on the sidebar, and – using the magical power of Internets – turned into a streaming AKradio playlist! Check out the sidebar entry here, and then click on the akradio link just below the banner to listen along. Murat Eyuboglu was at the recent Unusual Animals show slash Shapes and Sizes release party in Brooklyn on May 13, and luckily brought his camera along. What resulted is a set of gorgeous photographs. View them on Flickr, here, or visit Murat’s website here.